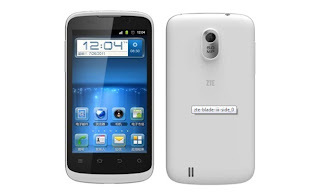 ZTE Blade III that was leaked last month is now official. ZTE officially announced the launch of all new ZTE Blade III- the third smartphone in the Blade series from ZTE, surely another budget smartphone from ZTE. The Blade III, which sports a 4-inch display, 1GHz Qualcomm CPU, and Android 4.0, will be available first in Finland, with a release planned for this month. In October it will reach Sweden before going on to launch in other European and global markets in the future. The phone’s retail price has been set at 1499 SEK, or roughly $230. It is powered by Qualcomm MSM 7227A chipset with a 1GHz Processor and The Android 4.0 Ice Cream Sandwich OS. This gadget has got a 4 inch WVGA capacitive touch screen display with a resolution of 800*480 pixels. It has got 512MB RAM capacity. ZTE Blade III is built with 4 capacitive buttons at the bottom of the display. A 5MP camera with Auto-focus is provided for image and video capture. The internal memory capacity is 4GB. It has got HSPA connectivity too. Bluetooth, Wi-Fi and GPS are other major highlights of this gadget. The microSD slot can expand the memory upto 32GB. The ZTE Blade III would be available in white color in Finland in September and in black color in Sweden in October for 1499 Swedish kronor (~US$ 229) and will also be heading towards to other European countries for sale later in the year. 0 Respones to "ZTE Blade III is officially announced"